The totality of "Searching" is presented as if it were drawn from the contents of desktop computers and iPhones—juxtaposing, for instance, two sides of a FaceTime call with phone logs, satellite maps, open windows playing YouTube videos, etc. Other films have tried to tell a story this way ("Unfriended" is one example, though it's nowhere near as clever as this movie, or as knowledgable about the tech it shows us). But none have done as fine a job of integrating the emotional and narrative content of a story with all the visual and sonic bells and whistles, so that it all plays as a seamless whole and feels organic and true to how we live now. Consider the prologue, which takes us through the death of David's wife and Margot's mother Pamela (Sara Sohn) from cancer. It's a little masterpiece of narrative compression that deserves favorable comparison with the opening of Pixar's "Up," not just because of its ability to elicit tears, but because it compresses a feature film's worth of emotional power into a few fleet minutes without making you feel as if the movie had rushed you through anything important. I can't think of another recent sequence that better shows how our emotions are intertwined with the boringly ordinary digital tasks we perform all day, every day. Notice, for instance, how David moves videos that will have enormous nostalgic value later into specific folders to make them easier to find (which immediately communicate how important they are to him, and how important that will be to the movie). Also impressive is the way the film treats the simple act of scheduling events (like Pamela coming home from the hospital) as indicators of the family's fears and dreams, and devices for generating empathy as well as suspense (every time David moves the homecoming date, we can feel our stomachs tighten up a bit more, anticipating the worst). 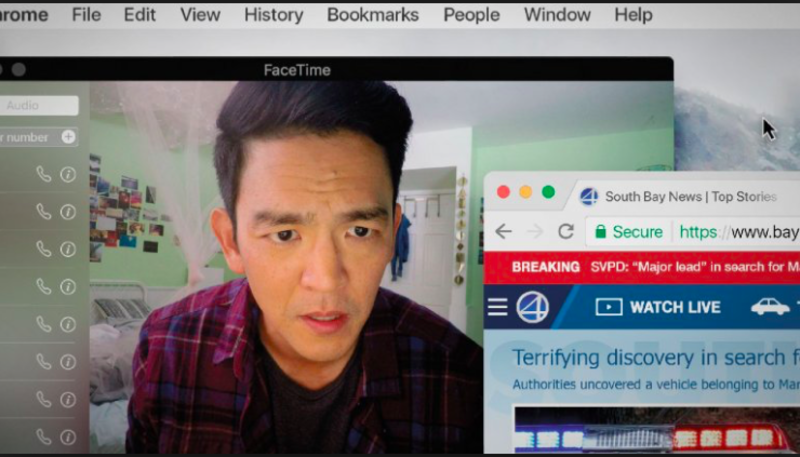 As directed by Aneesh Chaganty and cowritten by Chaganty and Sev Ohanian, "Searching" makes a statement about how life is lived, and how movies are lagging behind in rarely depicting that life, all without seeming to make a statement. Everything shown in the movie is something we see everyday on a laptop or phone or iPad screen, but seeing it blown up to feature film dimensions (I recommend seeing "Searching" in a theater if possible) puts the data in a new context, makes us appreciate textures we'd otherwise take for granted, and finds poetry and mystery in what we'd ordinarily think of as a technical limitations. (When Chaganty zooms or crops into a wide shot of people who are pictured from head to toe, the fuzzy borders of their heads and bodies become painterly.) It's analogous to the way David pores through all the available information he has in order to find clues and answers, only to keep running up against the limitations of what facts alone can tell him. This happens whenever you're trying to solve a mystery involving someone you know. Sometimes you get a piece of data that feels relevant and useful, but there are still limits to what it can tell you. Equally notable is the way "Searching" lets its main family be culturally specific without the movie becoming a meditation on what it means to be Korean-American, to the exclusion of all else. This is not to dismiss films that are specifically about that (there should be many more of them than there currently are), but to point out one of the unfortunate pitfalls of casting genre films with predominantly nonwhite casts: even if the movie isn't meant as a referendum on the state of a particular culture, ethnicity or race, it gets read that way by predominately white American audiences and critics, often inappropriately. "Searching" hits a sweet spot: it's a film with Korean-Americans in lead roles that cares deeply about them as Korean-Americans, rather than presenting them as "raceless," but it functions as a very effective thriller from start to finish. Many plot elements, from the way that Margot and her mother bonded over piano to the way Peter calls up David for help with a "kimchi gumbo" recipe, will strike specific emotional notes for Korean and Korean-American viewers. But these are always adjacent to the main function of a scene, which is to flesh out the characters and drive the plot forward. Notice, for instance, how the piano stuff pays off at the end, with a revelation of why Margot stopped going to the lessons after her mother's death, and how the discussion of the kimchi recipe pays off what had originally seemed like a purely comedic beat: David disapprovingly noticing Peter's marijuana buds in a jar sitting in plain view on the counter. "Searching" is a formally playful film that's constantly thinking about how to make all the media it shows us feel organic and not too fussed over, while also constantly trying to come up with ways to arrange the material that will make it more traditionally "cinematic." One of my favorite examples is the scene where David goes over to Peter's apartment to confront him, surreptitiously planting tiny cameras in three locations to record incriminating information. One of the angles lets us see David through the open front door of Peter's apartment, checking the feed of all three hidden cameras on a laptop in his car—a deep focus composition worthy of Orson Welles or John Frankenheimer. As the brothers move through various rooms, the director slides from one window to the next, tracking their motions in a way that's elegant and exciting, and that feels as he's "panning" through a single set with a film camera on a tripod, even though he's moving across boxes on a flat computer screen. When the brothers struggle, one of the cameras falls from its original position and lands on the floor pointing up. When David sits on a chair in that shot, the low, ominous angle is as close to a classic film noir image as "Searching" has given us. It's wonderfully correct for that moment in the story, and delightful for how it manages to be extremely showy while acting as if that's just where the camera happened to fall. It's rare to see a commercial film that's this suspenseful and emotionally involving but that also feels electrifyingly new. This one pulled me in from frame one and never let go, and delivered all the satisfactions I wanted from a mystery-suspense film while also giving me lots to think about, purely through its decision of how to tell the story. I have no idea how well "Searching" is going to hold up in twenty or even five years; given the rapid pace of technological change, it seems possible that at lot of the software and devices presented here will seem quaint. But it's still fun to see moviemakers treating everyday rituals that so many films ignore as being integral to its story, and thinking about how the most intimate aspects of life have become digitized and made virtual, and what that means for the species. Next Article: Love, Gilda Previous Article: 30 Minutes on: "The Meg"
30 Minutes on: "The Meg"